For reasons that I have mentioned before, it is crucial to get tested for Coeliac disease (CD) before you begin any elimination diets that cut out the gluten containing grains – this includes the low FODMAP diet, which eliminates wheat, barley and rye for the two month elimination period due to their fructan content. Oats also contain a protein called avenin, which is very similar to gluten and can also cause issues in overly sensitive individuals. There are many reasons why it’s important to be correctly diagnosed (which includes ruling possible differential diagnoses out) but I’ll expand on the most relevant to fructose malabsorption (FM) or the low FODMAP diet. What is the difference between Coeliac disease and non coeliac gluten sensitivity? Coeliac disease is an autoimmune condition in which your body’s immune system reacts to the plant-protein gluten (found in wheat, barley, rye and their derivatives) in such a way that your small intestine lining becomes the target, causing damage to your small bowel and villous atrophy. Villous atrophy in turn leads to a reduced surface area for nutrient absorption, which can contribute to malnutrition, malabsorptive disorders, osteoporosis and many other secondary complications, such as an increased risk of certain cancers. To rule CD in or out, a blood test to check for tissue transglutaminase antibodies is performed and followed up with an endoscopy to confirm any damage to the small intestine. Non coeliac gluten sensitivity (NCGS), on the other hand, is not as well understood. It is the label given to those who test negative for CD, yet are still apparently affected by gluten. One study suggests that it is not the gluten in the grains but the fructans (acting alone or in combination with the gluten) that are causing sufferers to be symptomatic. Other research hints that it might be an innate immune response, rather than the adaptive immune response of CD, which causes the reaction to gluten-full foods and leads to symptoms that are very similar to those experienced by Coeliacs. Because there is no science-based standardised test to check for NCGS, the diagnosis is one of elimination – other conditions, like CD or a wheat allergy, are ruled out but you find you still improve on a gluten free diet – and NCGS is the possibility that is left. If you do in fact have undiagnosed CD or NCGS, the low FODMAP diet isn’t anywhere near strict enough to be considered safe for you, as after the elimination phase comes the reintroduction phase, in which you are encouraged to test out foods higher in fermentable carbohydrates – this includes offending grains, which will just make you sick again. If you have CD, you must limit your gluten exposure to basically nothing (less than 20 ppm in the USA is considered safe), so even a contaminated chopping board or deep fryer could make you sick, let alone testing out a full slice of bread. If you have already been diagnosed with CD, you can skip those foods, saving you time and gut hurt… or any of your other symptoms that are caused by gluten. Furthermore, if you have undiagnosed CD or NCGS, once you have finished the elimination phase and begin to test out wheat, rye and barley, you’ll realise that they bring on symptoms (either IBS or other) and you won’t know whether FM or CD is behind them – and to test for CD, you need to have gluten in your system for an established autoimmune reaction to be visible. If you haven’t been eating gluten, any damage from CD, or any sign of the relevant antibodies, will begin to disappear, meaning that you may test negative, regardless of whether you have active Coeliac disease or not. This is called a false negative result. If, for one reason or another, you find yourself having been on a long term gluten free diet, yet needing to test for Coeliac disease, there is unfortunately no other way to confirm the diagnosis than to complete a gluten challenge. Instructions vary slightly but, in general, it is recommended that every day, for somewhere between six to twelve weeks (ask your gastroenterologist what they would prefer), you must consume the equivalent of four slices of bread if you’re an adult, or two slices of bread if you’re a child. Bread is typically at least 10% gluten by weight. This means that the average slice of bread contains approximately 3 grams of gluten. Extrapolating from the number of slices necessary for the gluten challenge, the gluten requirement works out to be 12.0 g of gluten for an adult and 6.0 g of gluten for a child, daily. After writing the previous post, it seems almost hypocritical to tell you that I had to complete a three month gluten challenge in 2014. You can read my diagnosis story here but, long story short, I tested negative to Coeliac disease (both the antibody blood test and endoscopy) back in 2006 but then tested positive for fructose malabsorption. However, after eating largely gluten free (I didn’t worry about minute levels of contamination), I found myself, at the beginning of 2014, experiencing worsening IBS symptoms and extreme fatigue/brain fog. Ev even asked if I was broken. Now, I felt pretty certain that the culprit was the spelt flour (non-sourdough) that I had been consuming, after reading that it was low FODMAP – note, only sourdough spelt is considered low FODMAP, I had just read inaccurate information. However, the question stood: was it the fructans or the gluten that was causing this relapse? I know that many people out there would happily re-eliminate the spelt flour and move on with their lives – but I’m not one of them. If there’s a question, I’m the type of person who needs to know the answer. So, I spoke to my GP, who referred me to a gastroenterologist and I began a twelve week gluten challenge. However, I know that fructans in wheat (and to some extent, rye) make me sick – what was I to do? 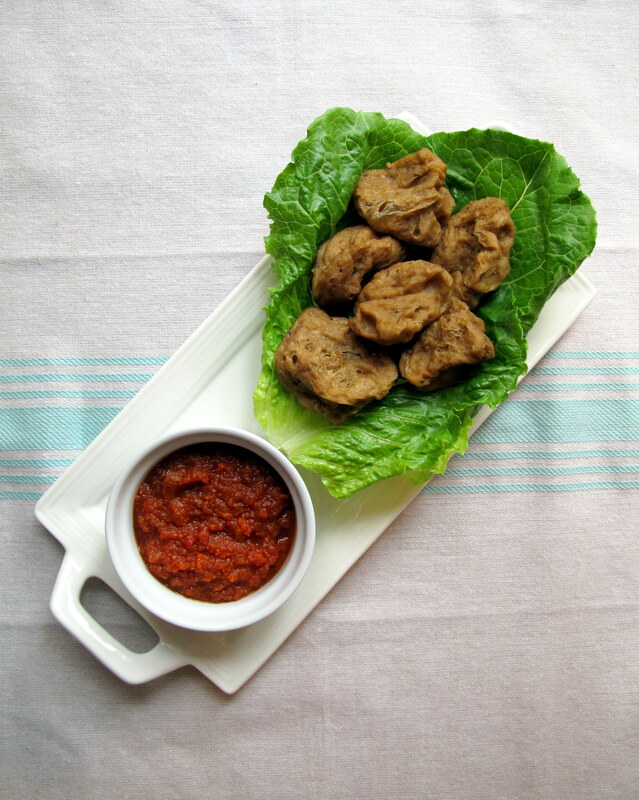 The answer to your low FODMAP gluten challenge question is: SEITAN. 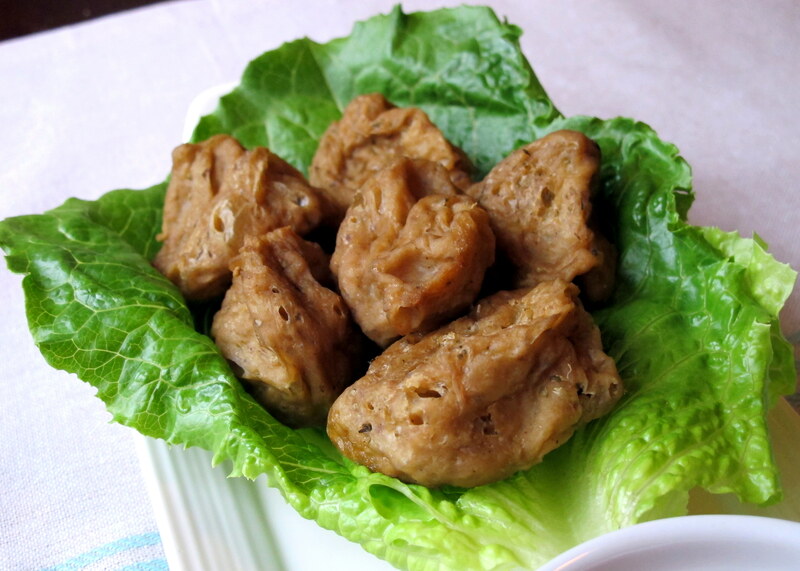 Seitan is a vegan protein/meat replacement that is made from vital wheat gluten, which is normally 75-80% gluten – and coincidentally, registers as low FODMAP. Now, let’s do some maths… stand back. An adult needs to consume 12.0 g of gluten per day, a child 6.0 g.
Let’s assume that the vital wheat gluten (gluten flour) was only 75% gluten, to be safe. However, if you can get a more pure version of it, do so, as the more gluten it contains, the less likely it is to contain any FODMAPs. 12.0 g / 75% = 16.0 g, so an adult would need to consume 16.0 g of the vital wheat gluten, daily, to ensure we are getting at least 12.0 g of low FODMAP gluten. A child would obviously only need to consume 8.0 g.
The recipe below is in grams, to keep it simple: 240 g of VWG will give fifteen 16.0 g servings or thirty 8.0 g servings. 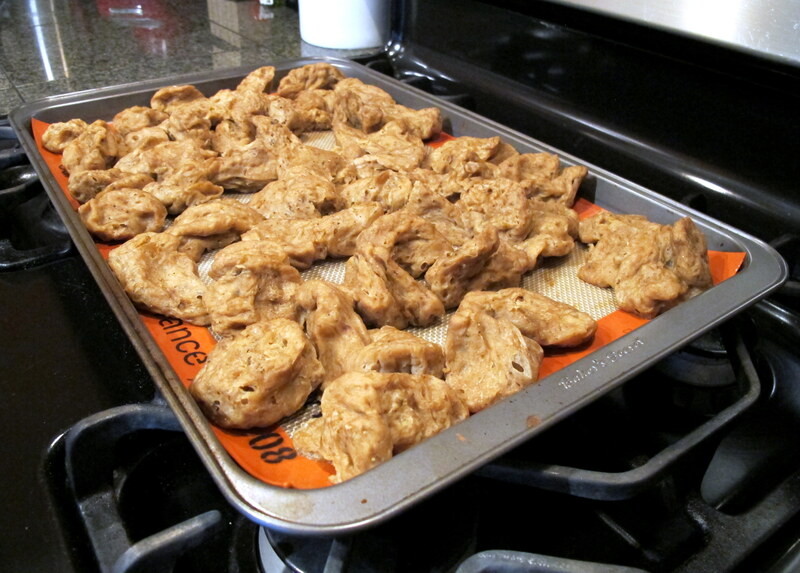 You could just pop your seitan chunks like a form of medicine and be done with it but it was fun to experiment with it in cooking and I probably ended up consuming more than the 12.0 g of gluten on the days when we did so… which might have contributed to my gut’s unhappiness and the fatigue. Based off Bob’s Red Mill’s basic seitan recipe. In a large pot (I cannot emphasise this enough, seitan balloons!) bring the broth mixture to a boil. 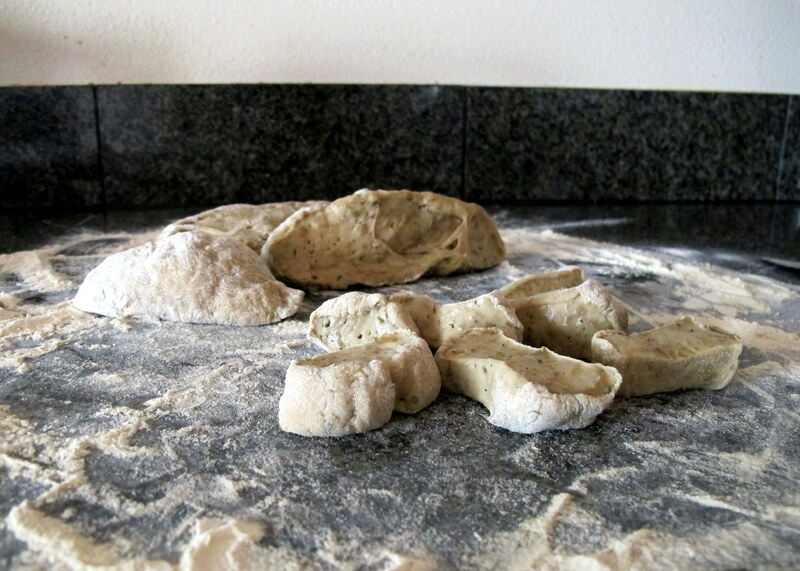 Meanwhile, mix the gluten flour, herbs, salt and pepper together in a large bowl. Slowly add in the stock and stir/knead until it’s a sponge-like dough. It should be tacky to the touch but not wet. 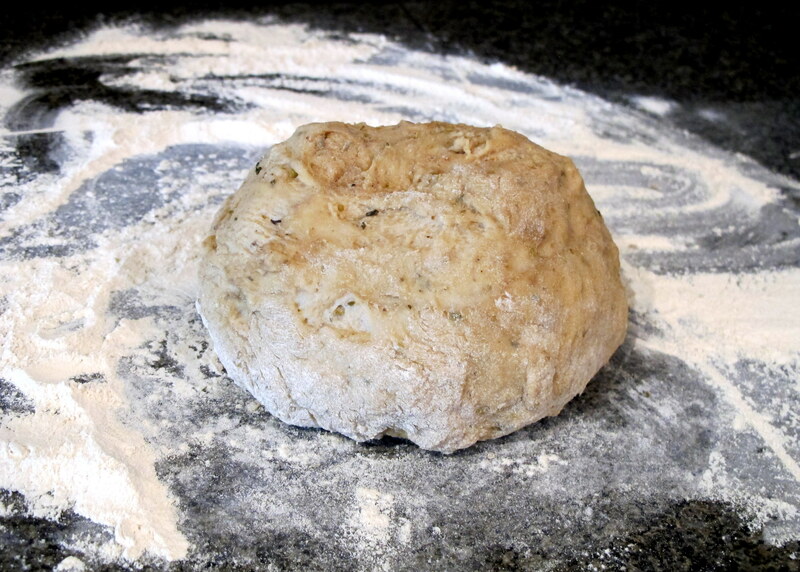 Tip it out onto a well floured bench (use more gluten flour) and knead it for a minute or two, until it becomes tougher and more elastic. Cut it into sixths, then roll them out into logs and divide each one into twenty. There you go, you now have 120 pieces and four pieces equals one daily serving of gluten for an adult. 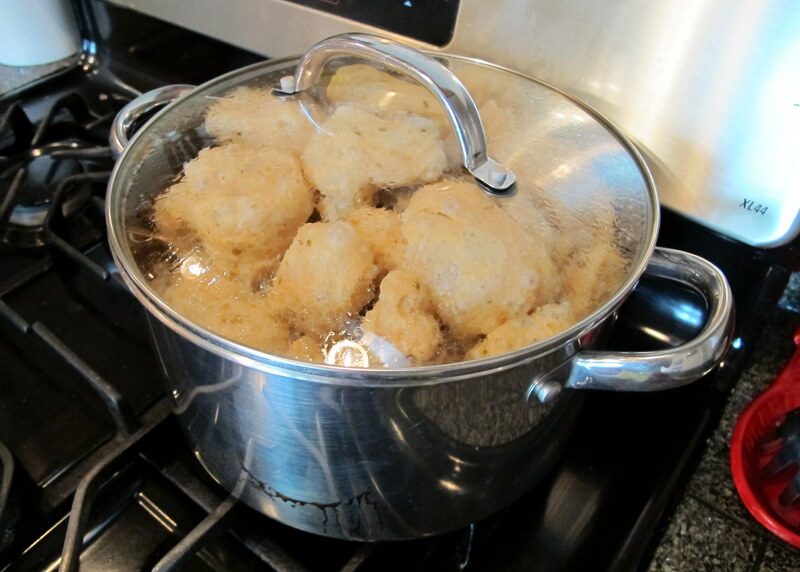 Place the seitan dough in the boiling water and boil for one hour. Watch how it expands – I needed to swap saucepans halfway through. 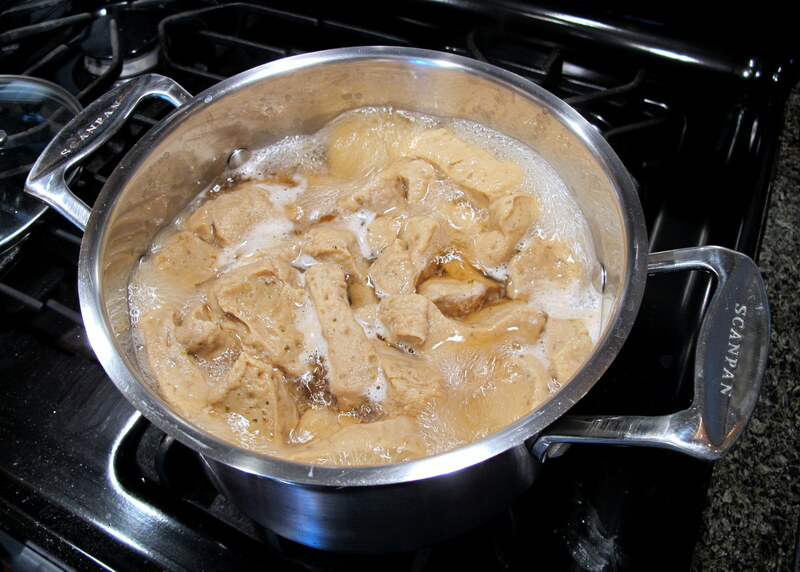 After boiling, the seitan still isn’t good to eat. At this point, I like to think of it as “raw” meat. The flavour is nice, thanks to the spices, but the texture isn’t great. Spread the seitan out on a tray to dry, then use it in stir fries, pan fry it, bake it – it all works. For those who were just curious, I hope you found this piece interesting. For those who have fructose malabsorption or IBS and need to complete a gluten challenge – good luck. I didn’t find it fun, in terms of fatigue, but I hope you fare differently. After getting back to a normal diet (still no active Coeliac disease, phew), I have learnt that I can cope with a bit of gluten every now and then, so it’s clearly not as big of an issue for me as the fructans are. Luckily, that means that I can still enjoy (proper) sourdough breads in moderation. Yum. This post is intended for educational purposes only. Please run anything that I have written here by your doctor or dietitian (etc) to make sure it is suitable for your individual case. In terms of FODMAPs, vital wheat gluten is generally considered low but it is not recommended for consumption during the elimination phase of the low FODMAP diet. As always, it’s best to not need to do a gluten challenge at all, by testing for gluten/wheat related conditions before an elimination diet has begun but this isn’t always possible, for a variety of reasons. Unfortunately, you might react during a gluten challenge (that’s the point, after all); this method just minimises the chance of that reaction being due to the fructans in wheat as much as possible. This entry was posted in Not A Recipe, Research / Information and tagged autoimmune, celiac, celiac disease, coeliac, coeliac disease, FODMAPS, fructose friendly, fructose malabsorption, gluten, gluten challenge, gluten flour, gluten intolerance, gluten sensitivity, low fodmap diet, NCGS, non celiac gluten sensitivity, non coeliac gluten sensitivity, seitan, vital wheat gluten, wheat allergy. Bookmark the permalink. No worries! Good luck with the gluten challenge, I hope you get some answers. HI thanks for this info…i am about to embark on the gluten challenge and i am wondering if i could just eat the vital wheat gluten raw? I was thinking of just putting a tablespoon or two in my morning smoothie. thanks for your help! Hi Thanks for your help with this! i am about to embark on the gluten challenge and was wondering if i could just eat the vital wheat gluten raw? i was thinking of mixing a Tablespoon or two into my morning smoothie. any thoughts?